The INECAR was established in the School Year 1990-1991 when Fr. Raul Bonoan,S.J. was the President of Ateneo de Naga College. Dr. Emelina G. Regis, a faculty of then Math and Science Department conducted various initial activities like mini-research, environmental awareness seminars and environmental and ecological stage plays. These were requested by some schools and NGOs including some parishes of Camarines Sur, Albay and Sorsogon and the LGU of Naga City. That was also the time when environmental awareness started in Ateneo de Naga University. Fr. Bonoan saw the birth of several student organizations working for environmental conservation with the then Director as the moderator/adviser or co-adviser. These are the Enthusiastic Ateneans for Group Learning and Exploration or EAGLEs for Environment, Ateneo de Naga Nature Crusaders, and the Ateneo de Naga Biology Majors or ANBIOM. The major activities of these organizations are for environmental education using various approaches such as the Youth Theater for environment (Ateneo EAGLEs), enrichment and exposure trips of the youth, exhibits on environmental issues, and environmental education for grade school pupils (Nature Crusaders), and, mini-research involving environmental problems in various ecosystems, photo exhibits on biodiversity, and environmental education for high school students and out of school youth (ANBIOM). Some of the faculty of the Math and Science Department were also involved in these activities. It was because of this set-up that Fr. Bonoan transformed the informal group by providing an office room and a name for the office with Ms. Emelina G. Regis as its first director. Ms. Regis pursued a doctorate degree in order for the INECAR to grow in scientific expertise regarding the processes in the environment and its problems. When Fr. Joel Tabora, S.J. became the President, he saw the need for the INECAR to be separated from the Math and Science Department for future expansion. The present INECAR office has been expanding since the year 2000. From a director assisted by one (1) student assistant in the 1990s using a desktop computer with WordStar, and three (3) student organizations, it transferred to a new office space with an additional administrative/research assistant personnel in the late 1990s. 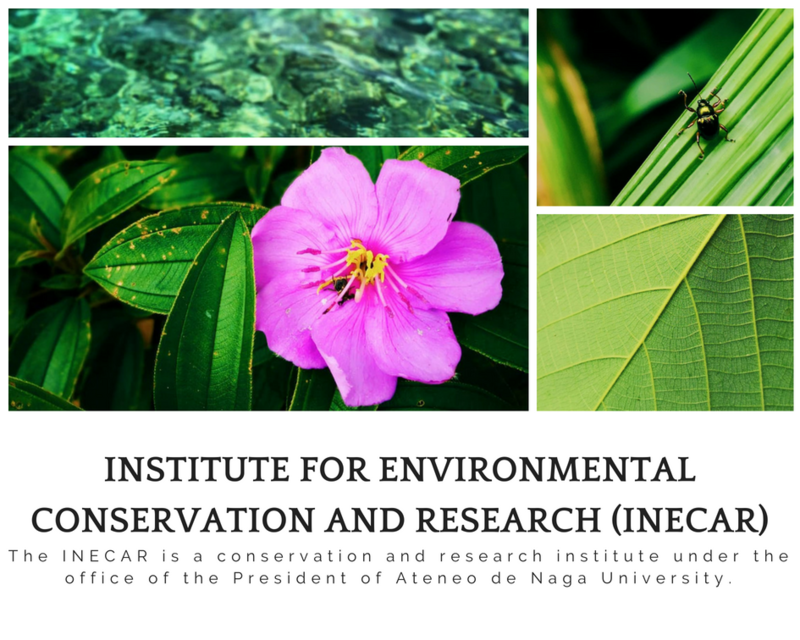 In 2002, students taking BS Environmental Management formed an organization named BANHI that also became an affiliated student organization of the INECAR, having now four (4) student organizations in its roster. Currently, there are now three (3) research assistants focusing on different scientific areas or topics and one administrative/research assistant and two (2) student assistants. A GIS training laboratory under the REGIS Hub as well as an extension laboratory where processing collected specimens is also attached to the INECAR.